Greenwich quarterback Gavin Muir (12) has committed to Dartmouth, where he will continue his football career. How’s this for leaving a winning legacy? 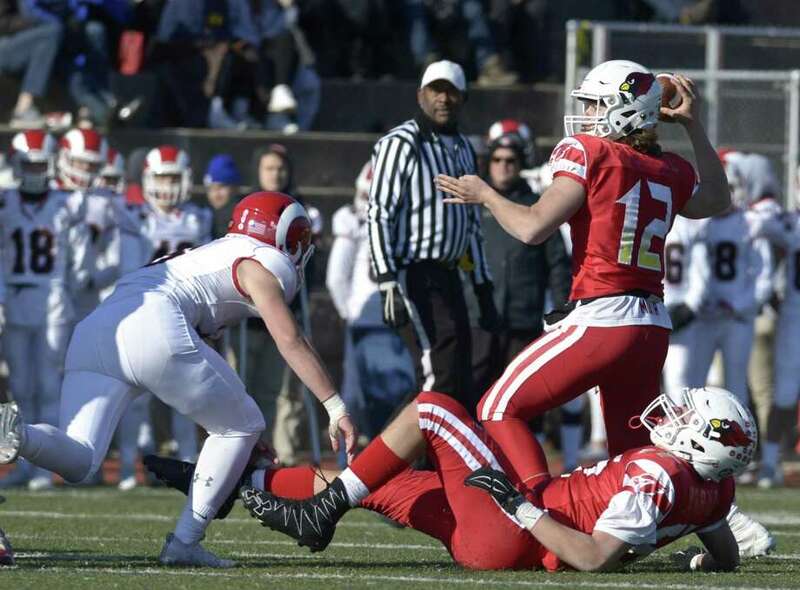 Senior Gavin Muir finished his Greenwich football career with a record of 25-1 as the squad’s starting quarterback, including a signature win in the Cardinals’ Class LL championship game against New Canaan. Muir rewrote the record books during his Cardinals’ career, shattering nine passing records during his two seasons as the team’s starting signal-caller. Soon Muir will be throwing passes for a team that’s had him on their radar for quite some time. Muir announced Sunday that he has committed to play Ivy League football at Dartmouth College. Coached by Buddy Teevens, Dartmouth registered a record of 9-1 in 2018 and finished second in the Ivy League standings. Greenwich’s record-setting quarterback also received offers from Wagner, Bucknell, Western Illinois and Fordham University. Stanford University and Syracuse each made preferred walk-on offers to Muir. Recruiting Muir was Dartmouth running backs coach Danny O’Dea. Greenwich coach John Marinelli, who guided the Cardinals to a 13-0 mark in 2018, couldn’t be prouder of Muir. Besides his excellence on the field, Marinelli appreciated the example Muir set for his teammates and younger athletes in Greenwich. Selected as the 2018 Walter Camp Player of the Year, Muir passed for 2,474 yards and 31 touchdowns his senior season for GHS, which posted a 34-0 win over New Canaan in the Class LL final. He holds team passing records for most career yards (5,767 yards), most passing yards in one game (387), most pass attempts in a career (683), pass attempts in one season (325) and career completions (401). Muir also has the most career touchdown passes of any GHS quarterback (71) and has records for touchdown passes in a season (33) and scoring strikes in one game (7). His 203 completions during the Cards’ 2017 campaign was also a record. While reflecting on Muir’s career, one of the games that stands out to Marinelli was Greenwich’s Class LL quarterfinal-round loss to Darien in 2016. Starting quarterback Connor Langan suffered an injury during the game and Muir came off the bench. Muir, an All-State, All-FCIAC Team selection, remembers the many practices with his teammates and of course, the state championship win against rival New Canaan. The effort Marinelli gave in helping out in the recruiting process was surely noticed by Muir.